What is landscape architecture? Is it gardening, or science, or art? In this book, Bruce Sharky provides a complete overview of the discipline to provide those that are new to the subject with the foundations for future study and practice. 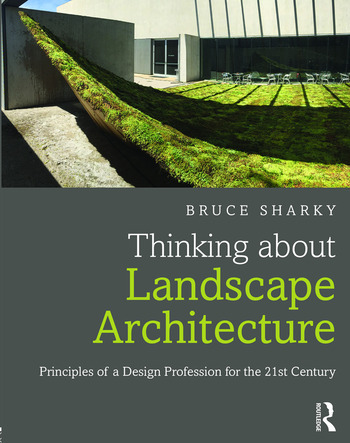 The many varieties of landscape practice are discussed with an emphasis on the significant contributions that landscape architects have made across the world in daily practice. Written by a leading scholar and practitioner, this book outlines the subject and explores how, from a basis in garden design, it 'leapt over the garden wall' to encapsulate areas such as urban and park design, community and regional planning, habitat restoration, green infrastructure and sustainable design, and site engineering and implementation. Thinking about Landscape Architecture is perfect for those wanting to better understand this fascinating subject, and those starting out as landscape architecture students. His interests in landscape architecture are varied and have evolved over the years and through work in varied locations and countries. He has worked professionally in Los Angeles, San Francisco, and Winnipeg, as well as in state government. He has lectured and taught design courses in countries as varied as China, Chile, Japan, and Israel, and was a Fulbright Scholar in Mexico and Portugal. He had a private landscape practice in Anchorage, Alaska, for 15 years prior to taking on the position of director of the Robert Reich School of Landscape Architecture, Louisiana State University. In 1990, Professor Sharky was honored as a Fellow of the American Society of Landscape Architects for his years of service and contributions to the profession.